Click image to enlarge Table Mountain, Washington, as seen from Hamilton Island, Washington, with part of the Bonneville Landslide in the foreground. Image taken February 19, 2013. Table Mountain is located on the Washington side of the Columbia River at River Mile (RM) 148, and rises above Stevenson, Washington and Cascade Locks, Oregon. 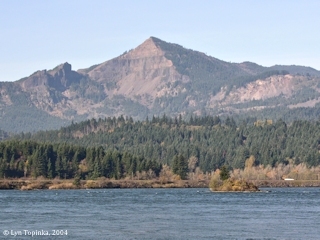 Magnificent views of the peak and it's companion Greenleaf Peak are visible from many areas along the Columbia. Cascade Locks, on the Oregon side of the Columbia, has perhaps the best view of Table Mountain. Other good views are from Bonneville Dam and North Bonneville, Washington. 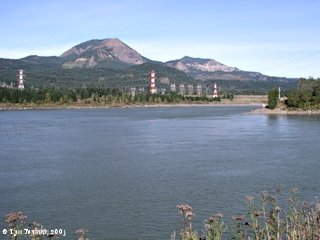 Downstream of Table Mountain is Aldrich Butte and Hamilton Mountain. 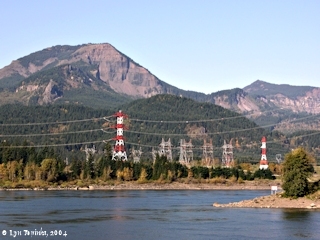 Table Mountain is part of the massive Bonneville Landslide event which formed the Cascade Rapids, a major barrier to early travelers on the Columbia River. Lewis and Clark reached this area in October 1805 and had to portage around the rapids. 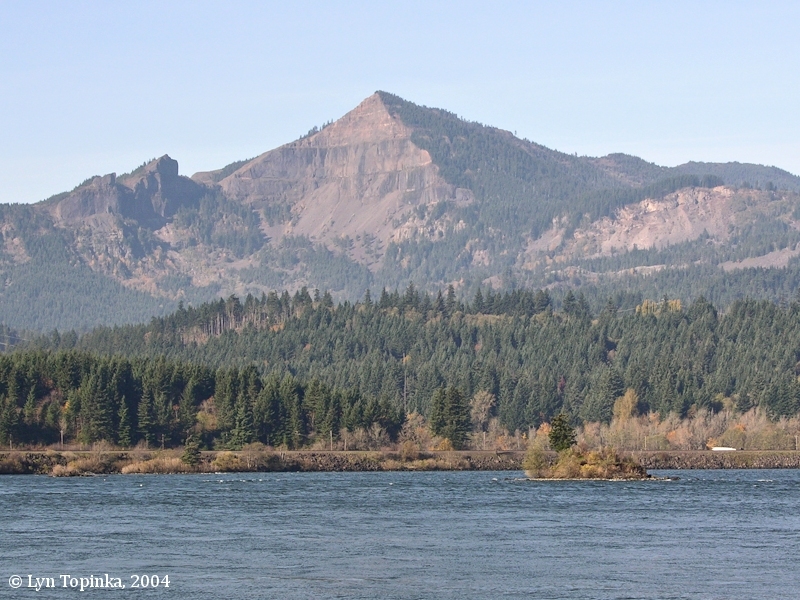 Lewis and Clark reached the Table Mountain area on October 30, 1805, and set up camp near Ashes Lake, just upstream of the "Cascade Rapids" and across from today's Cascade Locks, Oregon. Table Mountain rises over the area. From this camp the men took two days to portage down through the Cascade Rapids. 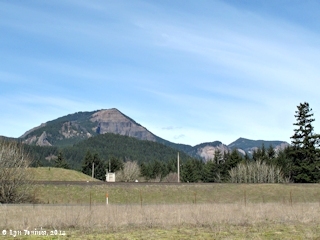 Click image to enlarge Table Mountain and the Bonneville Landslide, Washington, as seen from Cascade Locks, Oregon. View towards the location of Lewis and Clark's campsites of October 30 and 31, 1805 and April 12, 1806, near Ashes Lake, Washington, at the upper end of the Bonneville Landslide. View from Thunder Island, Cascade Locks, Oregon. Image taken November 4, 2004. 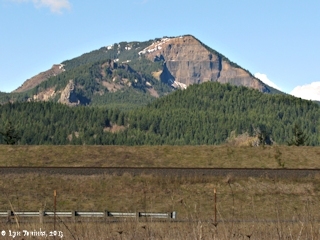 Table Mountain is part of the massive Bonneville Landslide event which formed the Cascade Rapids, a major barrier to early travelers on the Columbia River. The Bonneville Landslide is one of the greatest landslides along the Columbia River, diverting the river channel a mile, and creating the legend of the Bridge of the Gods. 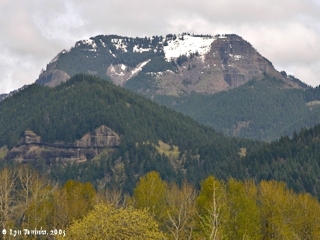 Click image to enlarge Table Mountain, Greenleaf Basin, and Greenleaf Peak, Washington, as seen from Cascade Locks Marina, Cascade Locks, Oregon. Image taken May 20, 2011. The slight southward dip of the Columbia River Basalt Group (CRBG) section and the underlying Eagle Creek Formation gives the western gorge an asymmetric physiographic cross section. In Washington, failure of weakly lithified Eagle Creek strata that dip toward the river under the load of superincumbent basalt has produced huge landslide complexes composed largely of CRBG debris. In Oregon, where strata dip away from the river, undercutting of the Eagle Creek Formation instead creates towering cliffs. As a result, the CRBG section south of the river consists of continuous cliffs, whereas to the north the CRBG forms scattered peaks (Greenleaf Peak, Table Mountain, Hamilton Mountain, and Archer Mountain) separated by low-lying terrain underlain by the Eagle Creek Formation or landslide debris. Each of these peaks is actually the southern end of a N-S ridge of CRBG, marking sites where basalt flows backfilled south-flowing tributaries of ancestral Columbia River." Source: Wells, R.E., Niem, A.R., Evarts, R.C., and Hagstrum, J.T., 2010, "The Columbia River Basalt Group -- From the gorge to the sea", IN: Geologic Society of America Field Guild 15, 2009. Click image to enlarge Table Mountain, Washington, from Robins Island, Oregon. Image taken October 27, 2004. Click image to enlarge Table Mountain and Greenleaf Peak, Washington, as seen from downstream of Bonneville Dam, Oregon. Image taken October 25, 2003. Click image to enlarge Table Mountain as seen from near the North Powerhouse, Bonneville Dam, North Bonneville, Washington. Image taken March 21, 2014. Click image to enlarge Table Mountain, Washington, from Hamilton Island, Washington. Image taken April 2, 2005.